by Kailen Rosenberg, author of Real Love, Right Now: A Celebrity Love Architect’s Thirty-Day Blueprint for Finding Your Soul Mate–and So Much More! Hurting after a breakup? To heal and grow from the experience, you must first be honest about your role in the relationship’s demise. Try these tips from my book, Real Love, Right Now. We must learn from each of our failed relationships so that we can be healthier and happier in the next one. Some of my clients claim that the end of their relationship was completely their partner’s fault and they did absolutely nothing wrong themselves. Clearly, these people are stuck in a place of ego and cannot see the truth about their own actions, but hiding from the truth about their own responsibility will only keep them stuck. You must be accountable for your own behavior in every failed relationship so that you can forgive yourself and move on to experience the love that God has waiting. Even in the most extreme examples—if you were cheated on or abused—you played a role by allowing this person into your life in the first place. Don’t get me wrong—I’m not saying that it’s your fault if someone has abused you, but you must see that you’ve played a role in what and whom you’ve accepted into your life. Because of an unhealed wound, you’ve ignored red flags and haven’t listened to your inner voice. I speak from experience about this. After separating from my first husband, I wasn’t looking for another relationship, but when I met a wonderful young man, I was moved by his incredible kind and positive energy, the way he treated people, and especially his relationship with his family. Although I wasn’t yet officially divorced, I found myself falling in love with him. For two years, we enjoyed a wonderful relationship, an almost perfect one, actually. I truly believed that he was my soul mate because of this. Throughout my relationship with him, I found myself healing from the wounds of my childhood. I was turning into a joyful being that I never knew existed. But one day, he told me that he had been having a relationship with another man the entire time that he had been with me. At that moment, I felt that everything I had experienced as love was a lie, and I became very hardened. He promised to get help and begged me to stay, but I was too angry. For years, I held on to my anger at him for betraying me, but after being honest with myself about my own role in this, I have finally been able to move forward. The truth is that I had no business being in a relationship with him at that time. I wasn’t even divorced from my first husband yet! His lie to me was that he was faithful, but my lie to him and to myself was that I was fully available. A lie begets a lie. I now realize that my entire relationship with him could have gone differently if I had been more honest with him and finished the work I needed to do in my marriage before getting involved with him. Meanwhile, he should have done his own work and been honest about who he really was before getting involved with me. But it is by accepting my own role and my own responsibility rather than blaming others that has helped me to heal and grow. 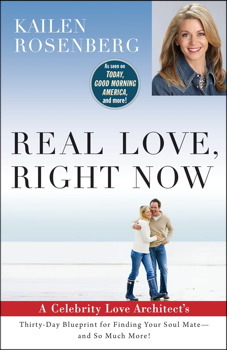 Real Love, Right Now: A Celebrity Love Architect’s Thirty-Day Blueprint for Finding Your Soul Mate–and So Much More! Real love is out there . . .
Kailen Rosenberg will help you find it. From the costar of the groundbreaking series Lovetown, USA on OWN: Oprah Winfrey Network, this is an encouraging, inspiring book to help you get past the things holding you back from finding real, authentic love. Kailen starts with a physical, mental, and emotional self-appraisal, which asks you to examine the things you don’t want to admit are holding you back, and helps you discover what you need to work on to have the best shot at finding a soul mate and creating a fuller, more rewarding love life. She then lays out a fail-proof, step-by-step thirty-day plan that will lead you to love when you have made yourself love-ready.